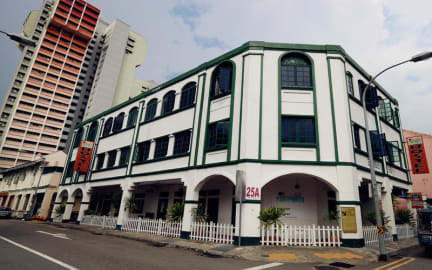 Nice hostel in Little India. You need only 3 minutes to the next metro station and with this line you can go direclty to Bayfront and Chinatown. The rooms has a socket at each bed and a locker. Rooms are older but still okay and clean. In the bathroom are enough showers in the morning. Staff is nice, you can store your luggage there and it is all you can eat breakfast (Toast with Jam/Peanutbutter and Coffe and Tea). The staff was very friendly and helpful. My socket wasn't working and they fixed it very quickly. The rooms and bathrooms were clean. Alsp it is quite central, you can reach a lot by foot or just a few MRT stations which I liked a lot. It's actualy a standart accomodation, but I been pleased with it. Overall very priceworthy as I booked with a discount. Staying for several days gets a problem though as the mattresses are quite hard and I had backpain nearly every morning. Nah an der U-Bahn, reichlich Frühstück und schönes Gebäude (Außen). Ansonsten für uns eher ein reines Schlaf-Hostel mit wenig einladenden Vibe. The location of the hostel is good but it's not the best hostel to meet people. The staff was more or less helpful and friendly - one staff member was and the other one wasn't. If you just need a place to sleep it's fine but if you're looking for atmosphere I wouldn't recommend it.